To fly into space, look into the microworld, discover the secret of life, immerse yourself into the realm of fantasy, partially reveal the future and live a science-fiction story. All of that, actually much more, can be found at the Brno Observatory and Planetarium. We are a centre for popularization of various sciences, especially in the field of inanimate nature. First of all, it is of course astronomy, but we do not avoid geology, chemistry, physics, mathematics, geography and a lot of other fields. All of that in a form which is understandable, entertaining and interactive. We are not a scientific workplace, but you can encounter science at every step. We are also engaged in promotion of Brno universities and big scientific projects carried out in the area of Brno. Up-to-date premises of the Brno Observatory and Planetarium are an ideal place for medium size events of congress and incentive tourism, specialized events for sponsors and advertising or barter partners, cultural activities (theatre and musical performances) as well as a little more intimate meetings. 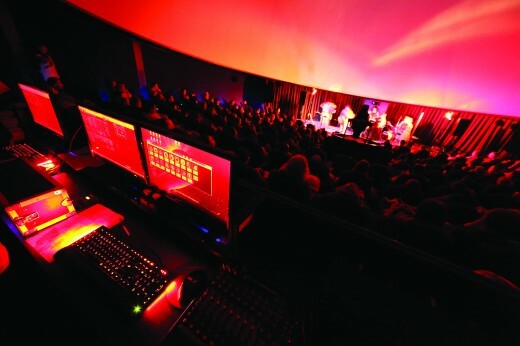 Most performances in the hall of the digital planetarium are simultaneously projected in English. Also all texts in the expositions are in English and/or German and there is also a printed English and German guide books available. 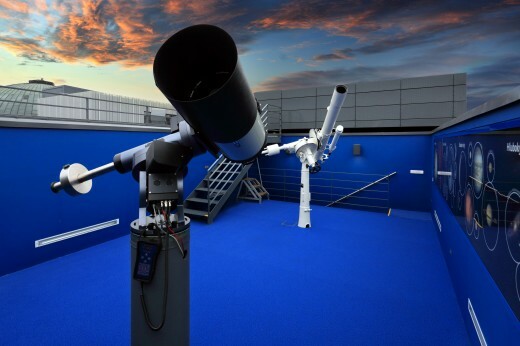 By prior agreement we are also able to arrange guided observations with our telescopes in English and German (for groups of at least 10 visitors). Please contact us by phone on +420 541 321 287 (on weekdays from 7.30 A.M to 3.30 P.M, except the holidays) or by e-mail (e-mail@hvezdarna.cz). Admission fees can be paid in cash only in CZK or by a payment card. What will you find in our centre? 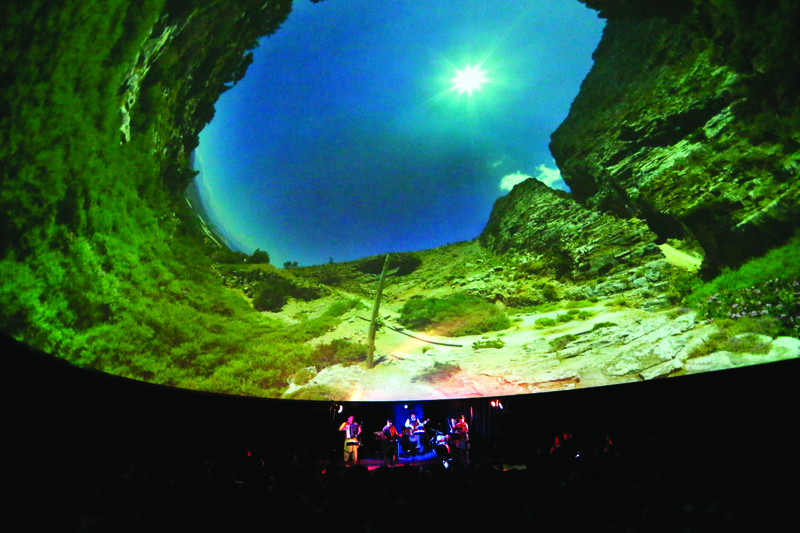 The digital planetarium will immerse you with its scene and sound. The series of special projectors combined with tens of computers can conjure a surprisingly true model of the space on the projection screen with a diameter of 17 meters. 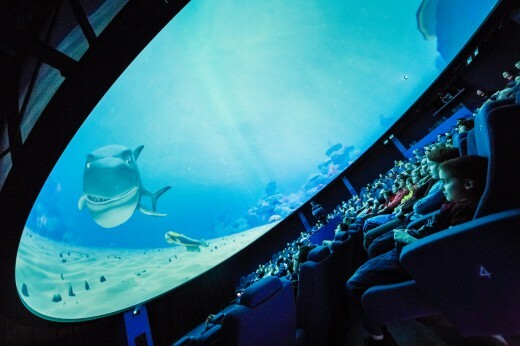 The repertoire of the digital planetarium does not include only astronomical shows. 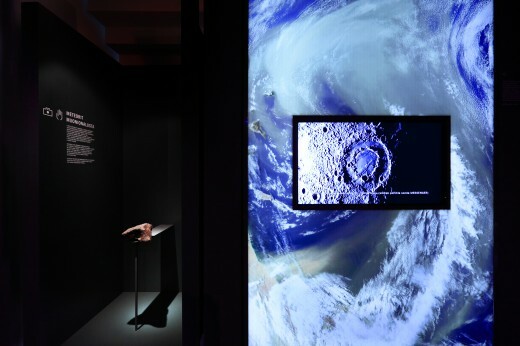 We will take you to the places that are hard to get to – under water, inside a human body, to the near future, to the microworld and macrocosm… Many of our shows are simultaneously projected in English. Headphones are available on request at the ticket desk. 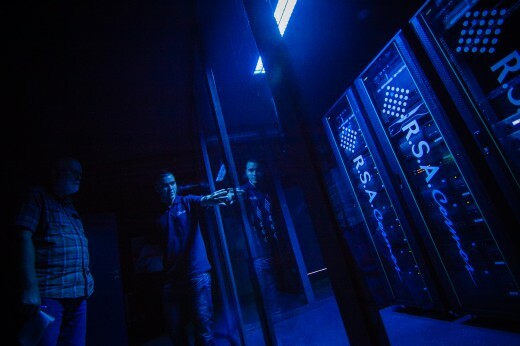 Unlike the Digitarium, you will not see an artificial starry sky, but it does not mean you will not be surrounded by the universe. In the hall of the Exploratorium you will find yourself in the Realm of Nebulae exploring it through large-scale backlit photographs of fascinating cosmic objects! You will learn about where stars are born and how they die. You will look into the past and the future of the Sun. And you will see the inside of a stellar nursery as well as the remains after a supernova explosion. In the Empire of Nebulae you will discover the greatest secrets of the lives of stars and find their beauty captured by absolutely perfect shots displayed in there. The visit to the Exploratorium hall is literally an artistic experience in which you can admire the surrealistic places where stars are born and die. Have you seen with your eyes the spots on the Sun, craters on the Moon, the ring of Saturn, the storms and satellites of Jupiter, crescent of Venus, colour binary stars, star clusters, nebulas and galaxies millions light years away? We can comfortably show you all of that with the help of modern astronomical telescopes with the lens diameter of up to 35 cm. Excursions in English and German only by prior agreement. Excursions in English and German only by prior agreement (for groups of at least 10 visitors). 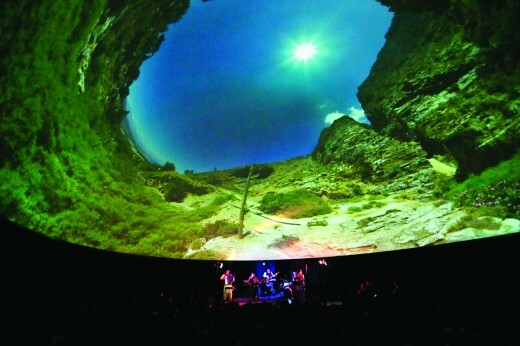 The Small Planetarium is able to conjure up an illusion of the starry sky with several conspicuous planets and the Moon on its dome with a diameter of 8 meters. 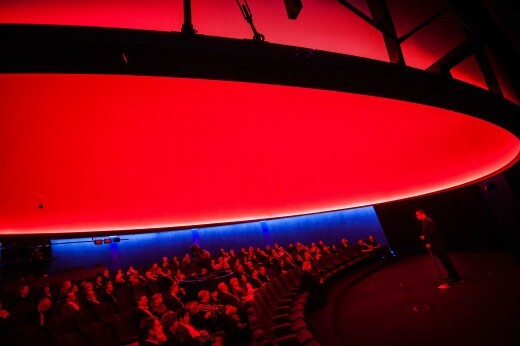 But unlike the bigger digital planetarium, it offers intimate atmosphere with a pleasant place to sit down. Excursions in English and German only by prior agreement (for groups of at least 10 visitors). The Observation Deck offers almost magical both day and night views of Brno. With your eyes, but also with the help of portable telescopes you can take a look at the night sky. Although it is not very dark, you can still see the Sun, Moon, planets of the Solar System and the most conspicuous star constellations from there. The Observation Deck is open during the day without guided observations. Selling and booking of the tickets with a small astronomical shop, as well as a place to sit down with simple refreshment Selling and booking of the tickets with a small astronomical shop, as well as a place to sit down with simple refreshment facilities and exhibitions, that is what the foyer of the Brno Observatory and Planetarium offers. Perhaps the most interesting is a huge picture of a small part of the constellation of Vela (Sails), where a very massive star exploded 11 thousand years ago. The Foyer is open during the day without a guide. From morning till night, from dusk till dawn, from Monday till Sunday, visitors of all ages can explore the world around them with their own eyes, ears and hands. In the vicinity of an old water reservoir from the 1930’s you can find several interactive exhibits such as a kaleidoscope, pixel wall, sound tube, gravity gauge and spectroscope. We are situated almost in the centre of the city of Brno, in a park on the hill of Kraví hora. By public transport you get to the Brno Observatory and Planetarium by a tram no. 4, tram terminal náměstí Míru/Masarykova čtvrť. Parking spaces (also for buses) can be found in the square náměstí Míru or at the swimming pool on the hill of Kraví hora. The building of the Brno Observatory and Planetarium was reconstructed in modern functionalist style in 2010 and 2011 by the company Skanska a. s. Brno according to the design of the architect Martin Rudiš. Inside you can find 47 km of cables ensuring all data transfers and 25 km of electric wiring. The unique sheathing of the whole building is decorated with 8,576,389 holes. The total amount of the building investment reached CZK 92.4 million (CZK 65 million from the European funds and 27.4 million from the city of Brno). 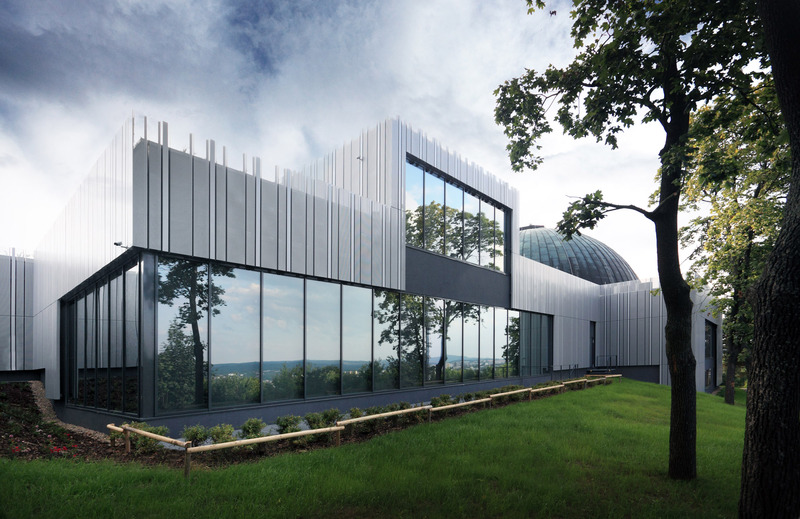 The building of the Brno Observatory and Planetarium got an award of the Building of the Year of the Czech Republic 2012 and also a nomination for the Mies van der Rohe Award 2013. 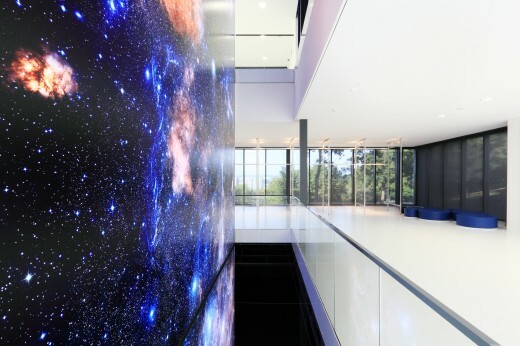 The projection system of the Digitarium has a resolution of 13.17 million pixels and in this resolution projects up to 60 shots every second. The general contractor of the Digitarium is a Czech-French consortium of the companies Nowatron Elektronik s.r.o. 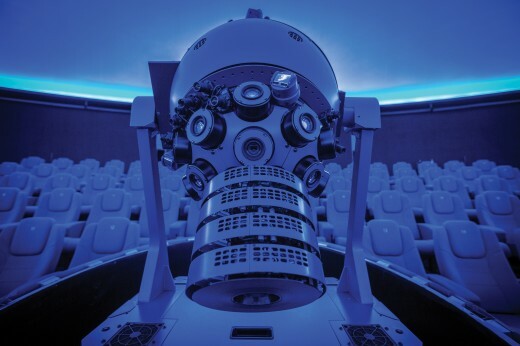 and RSA Cosmos, the earth night sky projector Chronos II was supplied by the Japanese company GOTO Inc., projection screen with a diameter of 16.76 meters by the American company Spitz Inc. and design seats by the company Kinoexport, s.r.o. The total amount of equipment investment reached CZK 56 million (50 million from the Ministry of Education, Youth and Sports of the Czech Republic). 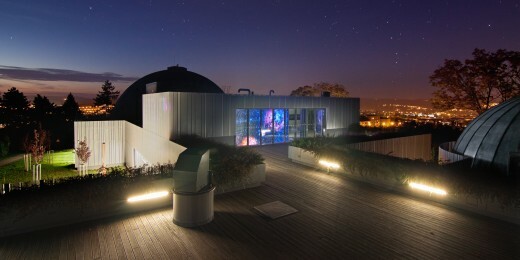 The Brno Observatory was open on 16 October 1954. At that time it only had one cupola with a smaller telescope. The first significant transformation happened in 1959, when another building was finished containing a lecture hall, observation point and first of all a projection planetarium made by the company Carl Zeiss Jena ZKP-1, which created an illusion of a starry sky on the dome with a diameter of 8 meters (the device is still in operation). Joining the observatory and planetarium as early as in the 1960’s resulted into a unique combination of very specific astronomical facilities, which is not very common in the world, but which offers a wide range of great opportunities in popularization of astronomy and scientific activities. Our employees at that time did scientific research – mainly of meteorites and variable stars. 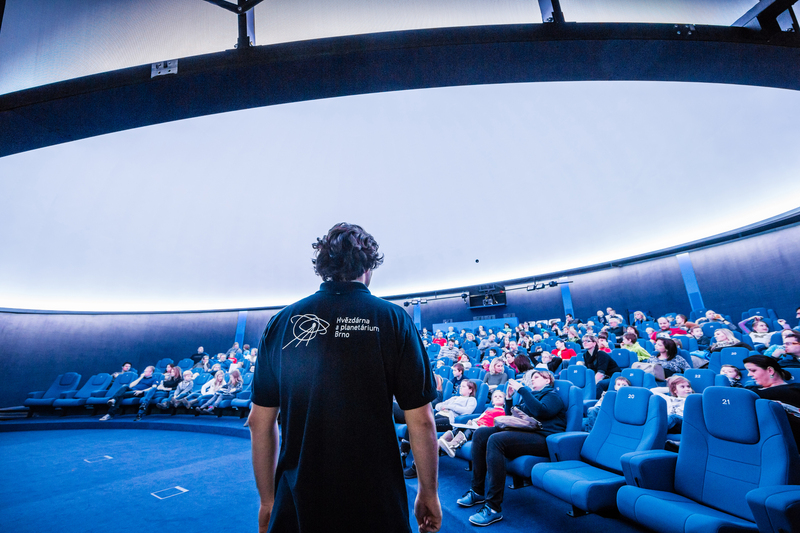 Without exaggeration we can say that the Brno Observatory and Planetarium became a real centre of amateur astronomical research in the former Czechoslovakia (present Czech Republic). The interest in astronomical programmes was still increasing, so at the beginning of 1980’s the officials decided to enlarge the building, of which the main part was a hall of the big planetarium (type Spacemaster from the company Carl Zeiss Jena). 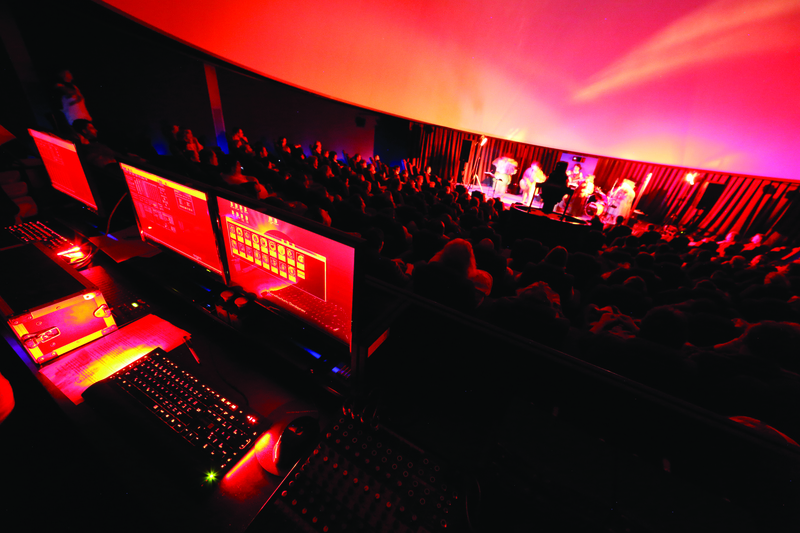 Although the new projection system was already bought in 1978, the building process itself started in 1986 and the big planetarium was not officially opened until October 1991. 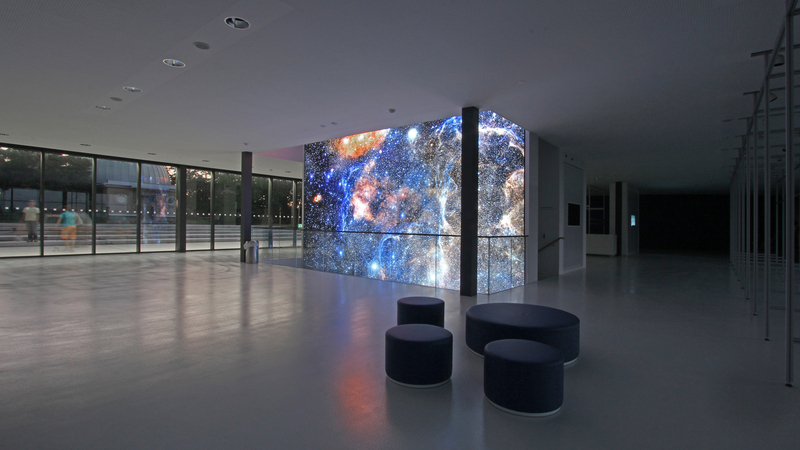 In 2005 the city observatory and planetarium began preparing a transformation into a multi-visual centre. The transformation did not involve only the building but also the programme orientation, personnel and the whole style of work. The foundation stone was laid down on 7 October 2009 by 16 astronauts from Bulgaria, South Korea, Poland, Slovakia, the Russian Federation and United States of America, and Vladimír Remek, the first Czechoslovak cosmonaut, became its guarantor. 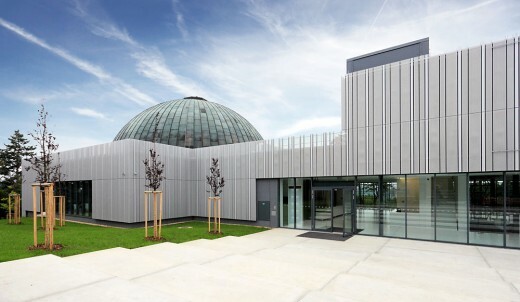 The complete reconstruction of the building of the Brno Observatory and Planetarium was finished in the second half of 2011. 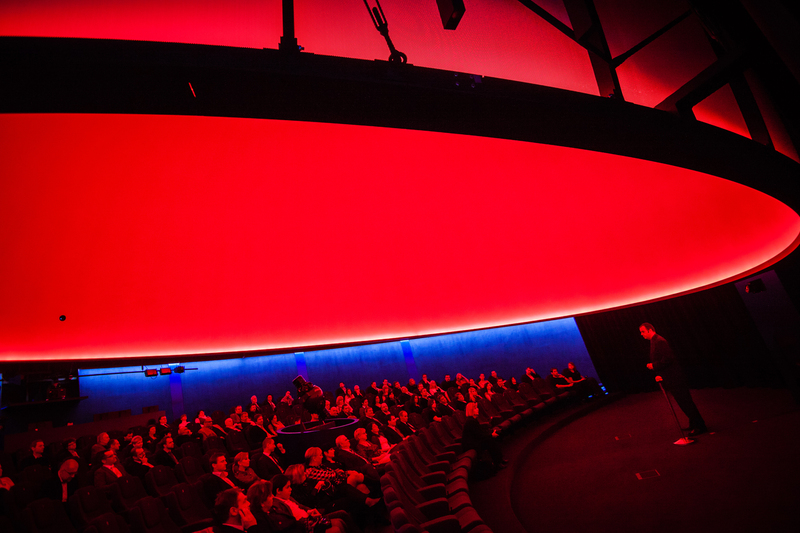 Then during 2013 the original planetarium was replaced by a digital projection system of the company RSA Cosmos combined with a projector Chronos II. The Brno Observatory and Planetarium is visited by more than 100,000 visitors every year (since 1954 over 3 million). We rank among the most visited institutions of this type in the Czech Republic. Its operation is ensured by approximately twenty employees who present about 200 events a year. The founder of the Brno Observatory and Planetarium is the statutory city of Brno, which contributes about CZK 80 to every visitor.